Last edited by Grover on Tue Dec 27, 2011 4:00 am, edited 1 time in total. Yay for the City of Frankfort ! Good news to hear that at least some cities are willing and eager to take on the responsibility of preservation. 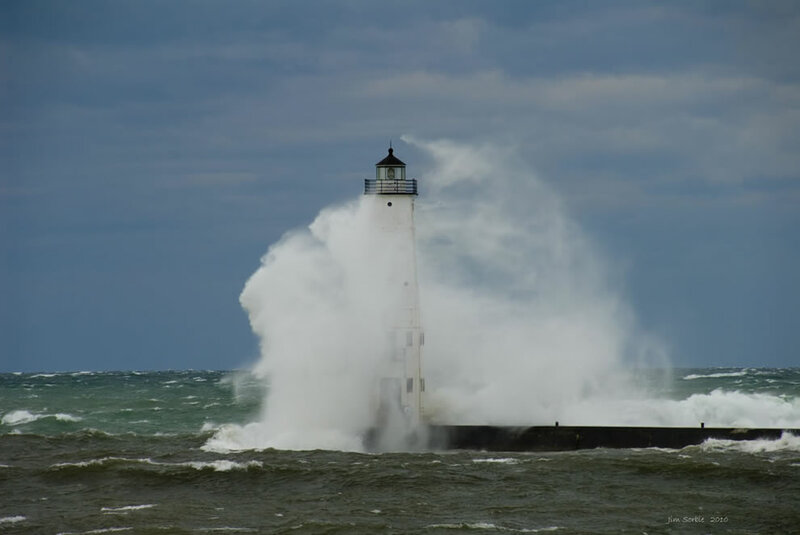 BTW, that is a great shot....Never got to see Frankfort Breakwater from that angle before. Awesome photo - and the sea doesn't even look that rough! - I mean, lake, not sea, sorry. It does not look that rough in the foreground inshore of the breakwater but it sure as heck is wild on the open water offshore. Note all those whitecaps of the breaking waves and the two large waves yet to break to the left of the tower. Those are real mean waves for sure! The Lakes can really get rolling, Tiny, and the waves are very powerful. I almost got washed off the St. Joseph pier six years ago while doing some photography there. Makes you respect the power of water right fast, it does. Wind on day of photo Nov. 18 at Frankfort---gusts to 50 mph. Another photo, same day. Better view of offshore waves.